The Kanchenjunga Uddhar Kendra, a Siliguri based organisation, is now likely to demand and seek CID probe in the minor Aakriti murder case. Talking to the reporters,the chief of the Kanchenjunga Uddhar Kendra, Rangu Sauriya said: "It is not that we have been sitting silently and keeping mum over the Aakriti murder case instead we have been in touch with the police administration continuously, seeking justice for the deceased minor Aakriti"
She also informed, "The three suspects of the case, who had been arrested earlier and later sent to judicial custody, have so far not confessed the crime." Hence, from their side, they have been keeping on pressure to the police administration to immediately nab the culprits involved in this heinous crime, She further added that the police administration assured them that they have been trying their best to solve the case immediately. Not only this, they have also been applying different methods to solve the case immediately. Ms. Rangu also added that if the matter is not solved immediately by the police, then they have been planning to seek the help of the CID over the case. She added that, apart from this, she and her organisation will go anywhere and take all possible measures, to provide justice to the minor girl. 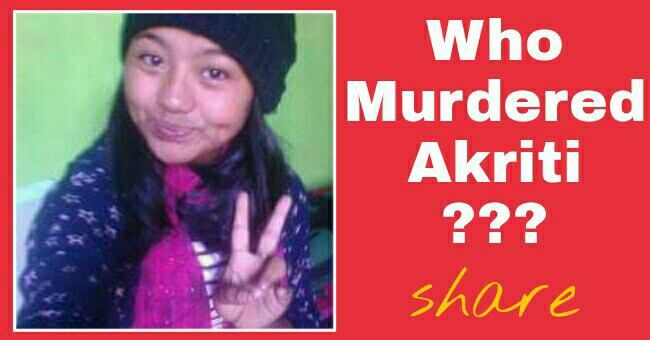 Notably, the 15 year old Aakriti had gone missing from 16 November 2016, while going to her school in Kurseong on foot from her Ambotia tea estate residence. Later, after a gap of around a month, on 17 December, the police had recovered her decomposed body from the cave of a stream near Kurbia tea estate located on the way in between Ambootia estate and Kurseong town. Meanwhile, different associations and organisations including individuals had condemned the incident and the Kanchenjunga Uddhar Kendra is one of them, which had not simply condemned the incident instead the organisation had taken different measures over solving the case.